How poorly Europeans understood South America at the beginning of the 18th century! A New Map of South America, Shewing its General Divisions, Chief Cities and Towns; Rivers, Mountains, etc. Dedicated to his Highness William Duke of Gloucester. 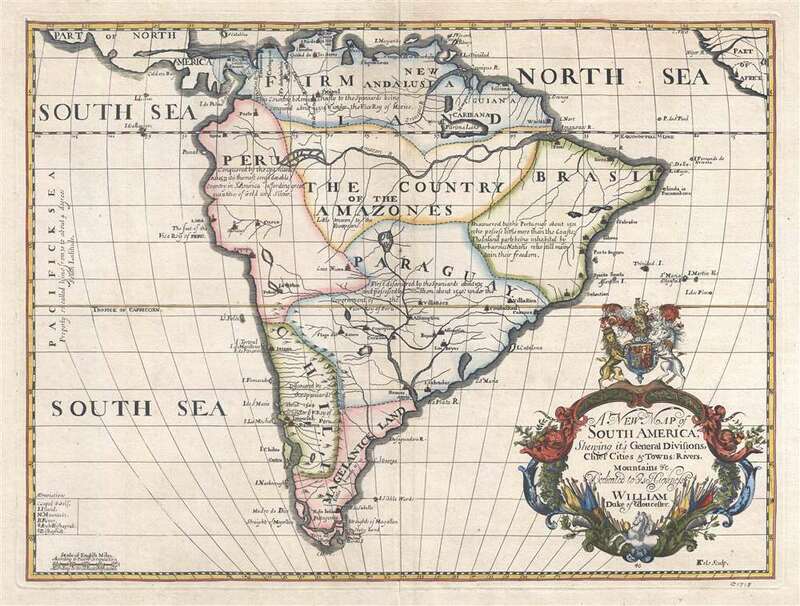 This is a 1700 Edward Wells map of South America. The map depicts the continent from Panama and St. Vincent to Tierra del Fuego and from the Pacific Ocean to the Atlantic Ocean. Sparsely illustrated, the scarcity of notations reflects the general lack of knowledge concerning the interior of South America. Annotations in each of the regions provide a date for when Europeans (almost entirely Spaniards, with the exception of the Portuguese in Brazil) conquered different regions and installed their own governments. Two regions, 'The Country of the Amazones' and 'Magelanick Land' are 'little known' to Europeans, meaning that they remained unconquered; even today, the Amazon Rainforest remains one of the least well-known regions on the planet. The Amazon River cuts its way across the northern portion of the continent. Numerous cities are labeled, including Buenos Aires (Buenos Ayres), Assumption, Cusco, Lima, Quito, and Cartagena. Several cities along the Brazilian coast, such as Pernambuco, San Salvador, Porto Seguro, and Spirito Sancto, are names used in modern Brazil either as city names or as names of region. Two lakes, Lake Parima and the Laguna de Xarayes, are both illustrated here, though only Lake Parima is labeled. Both lakes, which hold equal parts reality and fantasy in their mapping, are central to the European conception of South America and play a critical role in the mapping of the continent. Most Europeans believed that the likely site of the El Dorado of legend was the mythical city of Manoa, located here on the shores of the Lake Parima, near modern day Guyana, Venezuela, or northern Brazil. Manoa was first identified by Sr. Walter Raleigh in 1595. Raleigh does not visit the city of Manoa (which he believes is El Dorado) himself due to the onset of the rainy season, however he describes the city, based on indigenous accounts, as resting on a salt lake over 200 leagues wide. This lake, though no longer mapped as such, does have some basis in fact. Parts of the Amazon were, at the time dominated by a large and powerful Indigenous trading nation known as the Manoa. The Manoa traded the length and breadth of the Amazon. The onset of the rainy season inundated the great savannahs of the Rupununi, Takutu, and Rio Branco or Parima Rivers. This inundation briefly connected the Amazon and Orinoco river systems, opening an annual and well used trade route for the Manoans. The Manoans who traded with the Incans in the western Amazon, had access to gold mines on the western slopes of the Andes, and so, when Raleigh saw gold rich Indian traders arriving in Guyana, he made the natural assumption for a gold hungry European in search of El Dorado. When he asked the Orinocans where the traders were from, they could only answer, 'Manoa.' Thus did Lake Parime or Parima and the city of Manoa begin to appear on maps in the early 17th century. The city of Manoa and Lake Parima would continue to be mapped in this area until about 1800. This map was created and drawn by Edward Wells and engraved by Benjamin Cole in 1700. Benjamin Cole (1697 - June 15, 1783) was an English engraver and printer. Cole was known for his engravings of architectural subjects and trade cards, among many other subjects. He was an active Freemason and served as the Official Engraver of the Grand Lodge from 1745 - 1767. Very good. Even overall toning. Verso repairs to centerfold separations. Closed margin tears professionally repaired on verso. Blank on verso.